Jorge Lorenzo continued his stunning pace in his first year of Moto GP with his third pole and third podium out of three races, this time claiming the top step at Estoril for his first win. Even in a sport renowned for swelled heads, this kid has a reputation as having a serious ego, but it’s sure starting to look as though he’s got the parts to back it up. His Fiat Yamaha team-mate Valentino Rossi took third on Bridgestone tires (only Bridgestone runner in the top eight), and led about half the race until his tires began to go off. Conditions were chancy, with rain spotting the track, although everyone ended up staying on slicks. Still, both Rossi and Bridgestone were delighted with the podium. Second went to Repsol Honda’s Dani Pedrosa, who was close to Lorenzo the whole race but never looked like taking charge despite being in front of his fellow countryman for a few laps. His team-mate, 2006 world champion Nicky Hayden, crashed out of fourth while catching the leaders at about two-thirds distance, later saying, "You know, I got fourth place at Jerez and I certainly didn’t want to settle in there and ride around, so I had to push hard and you know when you push hard you make mistakes. It’s not a parade, you can’t just cruise around. It’s unfortunate because the bike was working good and we were hungry for a good result, so my own mistake." The top six was rounded out by Colin Edwards on the Yamaha Tech 3 bike, John Hopkins in the best finish of the year for the Kawasaki, and Casey Stoner on the Ducati. Edwards said, "When you are sitting on the grid with big rain spots on the visor, it is the worst feeling because you just don’t know what to expect … had it been dry from the start we’d have been good to fight for the podium. But with a bit of moisture I couldn’t get any heat in the side of the tire and no edge grip in the middle of the corner. Once I got heat into it I was motoring, which proved had it been dry, I’d gone for a good direction with Michelin. I wanted to be on the podium but I’ll settle for fourth." Hopkins, finally getting back to full fitness after his terrible pre-season testing crash in Australia, was a happy man, pleased with his ride and saying the next thing the team had to work on was qualifying better: "…we keep giving ourselves a lot of work to do in the race by having a poor grid position." 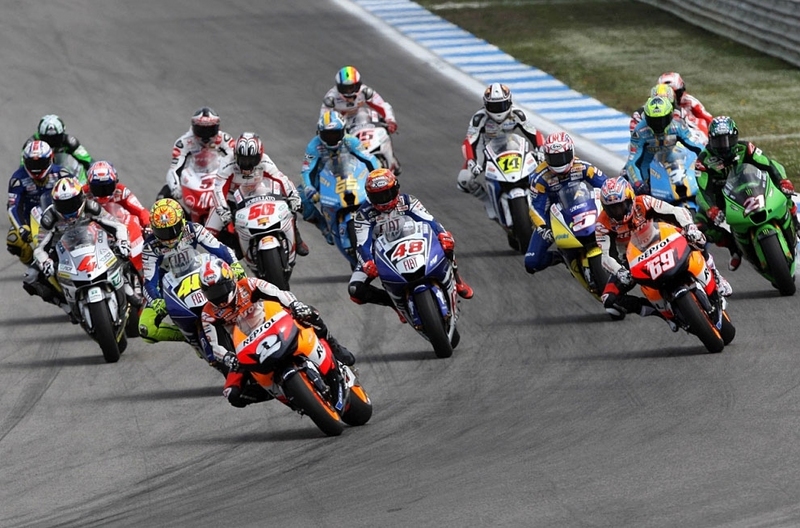 Defending world champion Casey Stoner was an extremely unhappy sixth, as not only had he not qualified well – back in ninth – but during the race one of the on-board cameras came loose and was flapping around interfering with the steering and the clutch. Under the circumstances, sixth was pretty impressive. Edwards’ team-mate James Toseland continued a great first year in Moto GP with seventh, buoyed by the fact that his team has already taken up an option to keep him around for 2009. Plus, Yamaha confirmed that they’ll continue to support the team at least through 2010. Even the Suzuki team came away happier than they have been; while eighth and ninth aren’t exactly what they want, at least both riders were in the top 10 and felt that the bike had definitely improved since the last race in Spain only a week before. Tenth went to Shinya Nakano on the San Carlo Gresini Honda, making it four Yamahas, two Hondas, two Suzukis, one Kawasaki and one Ducati in the top 10. Next race is May 4, around the world in Shanghai.